Fundamentals of Human-Computer Interaction aims to sensitize the systems designer to the problems faced by the user of an interactive system. 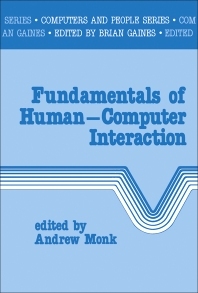 The book grew out of a course entitled ""The User Interface: Human Factors for Computer-based Systems"" which has been run annually at the University of York since 1981. This course has been attended primarily by systems managers from the computer industry. The book is organized into three parts. Part One focuses on the user as processor of information with studies on visual perception; extracting information from printed and electronically presented text; and human memory. Part Two on the use of behavioral data includes studies on how and when to collect behavioral data; and statistical evaluation of behavioral data. Part Three deals with user interfaces. The chapters in this section cover topics such as work station design, user interface design, and speech communication. It is hoped that this book will be read by systems engineers and managers concerned with the design of interactive systems as well as graduate and undergraduate computer science students. The book is also suitable as a tutorial text for certain courses for students of Psychology and Ergonomics. Chapter 4 Thinking and Reasoning: Why is Logic so Difficult? 12.2 Speech Articulation and Recognition: How Do People Do It? 12.3 Speech Production and Recognition: How Can Machines Do It?